An email subscription service. This nifty little feature allows users to subscribe to email notifications for DriveBC event information. You can tailor the report to suit your own needs, choose any area or route you want, including the ability to determine the timing of reports, severity and type of event you will be notified of. A Google trip planner for both our desktop and mobile websites. 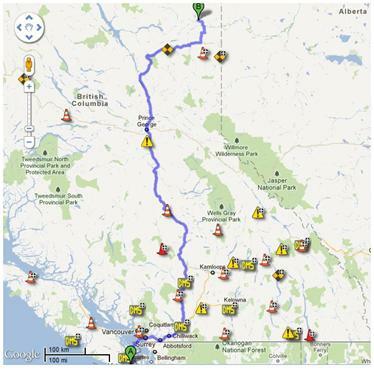 Using standard Google tools on the DriveBC map, you can now define an origin and destination point for your travels. The route will be highlighted and the planner will provide an info-window with estimated travel time and distance. Dynamic Message Sign information can now be displayed as a separate layer on the DriveBC map. This feature allows you to see messages being displayed on dynamic (changeable) message signs around the province, providing you with even more information to make driving decisions. “Replay the Day” allows you to view an entire day of webcam images in a single view. We know you will want to try this one right away, follow the link above to your favourite B.C. HighwayCam and watch the day unfold before your eyes. Cool! A mobile version of this feature is also in the works, so stay tuned. “Report a Highway Problem.” This new option allows you to report a non emergency problem, such as a pothole, to the appropriate maintenance contractor directly from your mobile device. Previously, connecting to the right maintenance contractor in order to report a problem was a little difficult, because there are 28 different contract areas to choose from. This new feature “knows” where you are through GPS, and connects you directly to the right contractor (by phone). If you are outside the problem spot, a Google-style map will help you pinpoint the issue and connect you to the contractor that way. High elevation weather forecasts are now included in the weather layer on the DriveBC map. By clicking on the “route forecast” icon (look for the icon with mountain peaks), you can view a weather report that provides a weather forecast for popular high mountain pass routes, rather than specific location. High elevation forecasts are provided during winter and fall only, because that is when you need them the most. And, to top it all off, we are also adding 30 new webcams to the DriveBC inventory which, along with the addition of a number of project Construction Cams around the province, will bring the number of webcam images to over 250! Installations will begin this spring, and we expect all will be in operation before winter. So, if you thought you knew DriveBC, take another look. Our recent improvements are worth checking out and will make it even easier to know before you go. Do you have more questions? Check out the DriveBC FAQ section, it is filled with information on these updates and other ways to enhance your DriveBC experience. Let us know what you think and happy motoring. TranBC Trivia: The Province launched DriveBC in 2005, and it is one of B.C.’s most popular websites, receiving an average of 2.9 million visits per month.